The title of my post is a complete contradiction, yet after discovering this charming inspiration board that uses Ikea accessories, retro chairs and vintage elephant framed art, it makes perfect sense! Jenny created this beautiful inspiration board to inspire her dear friend Anna. 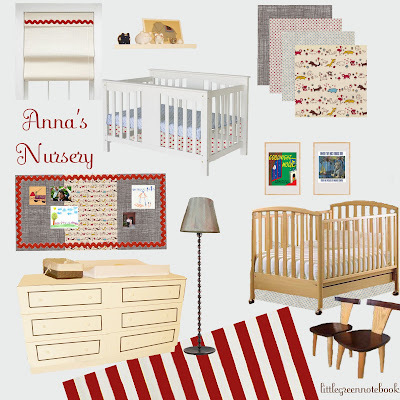 Anna recently moved into a new home and needed to come up with a design for her children’s shared (boy/girl) nursery. Jenny must be a super friend because she even spied cool chairs from Anna’s local craigslist – mind you Anna lives in a different city! You can learn more about the gender-neutral details (from fabric to ricrac) and Jenny by visiting her darling decor blog Little Green Notebook.